Last night I dreamed of Nauquasset again. Like the heroine of Rebecca, the heroine of Alena remains nameless throughout this provocative and spellbinding tale. But rather than take readers to an isolated gray stone mansion on coast of England, Alena takes readers to a progressive art museum on the coast of Massachusetts–where, like the second Mrs. de Winter, the new, young curator finds herself haunted by the legacy of her predecessor. Alena was released in paperback earlier this month and is an ideal book to enjoy outside on a park bench, at the beach or under the hugging branches of an oak or willow tree. It’s so wonderful spring has finally arrived! 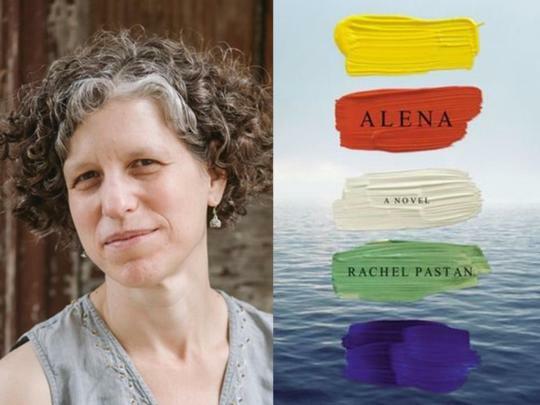 We had the pleasure of interviewing Rachel for the Literary New England Radio Show when Alena was first published in hardcover in winter 2014. Here is a mini Q&A with Rachel, though you can listen to our entire interview with her by clicking here. When you got the phone call announcing you had sold a novel, how did you react? I was at work, at my day job at the art museum—my novel takes place in an art museum—and I didn’t feel I could tell anybody. I just walked around in a daze for a while and then called my husband and my mother. That made it finally feel real. I’m very proud of the end of the book. My novel is a version of Daphne du Maurier’s Rebecca, which lots of people have read and loved. So I had to think of something for my ending that honored Rebecca’s ending, but that was also different and surprising. I always wish I could read the ending when I give presentations at bookstores, but of course you can’t do that. Who’s your favorite character in the book, and why? Who was the most fun to write? I love my main character (who doesn’t have a name; actually she does have one, but I’m the only person who knows it), because she keeps her sanity and finds peace, despite everything. I loved writing Agnes, the business manager at the museum, a spooky, large, middle-aged woman—often compared to a crow or some other big bird—who wears black dresses and dyes her hair pink and does her best to make the narrator miserable. If there was one thing in the main character’s life that you’d like to have in your own life, what would it be? What one thing in the character’s life would you never want? I’d like to have an apartment in San Francisco with a balcony. I’d never want to have to work for a selfish, shallow, petty boss like Louise!